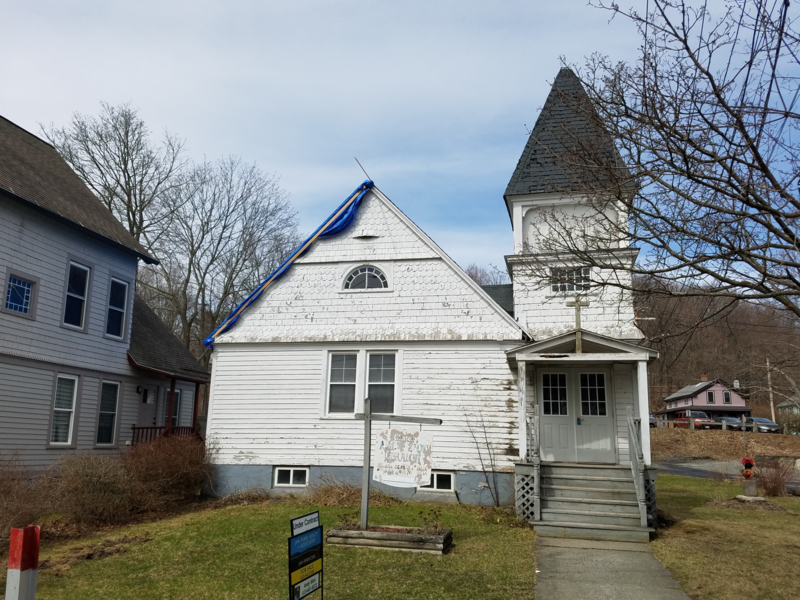 The former Clinton A.M.E Zion Church in Great Barrington, Mass. Tucked away just off Great Barrington's Main Street, the Clinton Church looks tired. The faded white paint on the building's exterior is chipped and peeling, the wooden cross above the front door is a weather-beaten gray and a big, blue tarp covers a large section of the roof. Inside, the main part of the church looked much like it did when it closed in 2014: a simple room with about 20 pews, wood paneling and even a piano still there. After a short walk to the alter, Wray Gunn, who is helping to save Clinton, reminisced about the place where he used to worship. "I had my kids baptized here," Gunn said. "I've been a member since about 1942, 44." And Gunn said this place is full of lots of other good memories for him. "We always brought in visiting ministers and they would bring their gospel-singing choirs," Gunn said. "They'd be up here singing, and we'd just have a jolly good time." But on this day, the heavy smell of mold in the old church forced the conversation back outside to the front porch. That's where Ed Abrahams waited. He's a Great Barrington selectman, and has also been instrumental in organizing the project. "A few people had come and asked if we could do something to save it," Abrahams said. "What I found out was a number of people had approached the church, had looked into what it would cost, and gotten scared because it was such a big project." Not everyone was scared off. After a meeting attended by about 25 people, fundraising began. And in about four months, the group raised $100,000 through more than 400 donations, enough to buy the church and make some immediate repairs. Abrahams said the next step is to raise money for renovation work. It will not be cheap. "The first time we brought an architect through he said, 'You're basically going to rebuild this while it stands,'" Abrahams said. "'You're going to tear out everything inside to the studs, and you're going to find that the studs are rotten and have to replace those.' So we have a lot of work ahead of us." W.E.B. Du Bois' involvement with this particular congregation dates back to before Clinton Church was built. As a teenager, he was elected temporary secretary to one of its more active groups, the Sewing Society. But it's hard to say how often Du Bois visited this building, which didn't open until he was about 19. Still, it's his legacy that's central to this restoration effort. Born in Great Barrington, Du Bois became a noted African-American civil rights activist and co-founder of the NAACP. Wray Gunn said he remembered hearing from his own father about meeting Du Bois. "He was a nice guy, but you know, he had his own principles and things, and very strong minded," Gunn said. Gunn said Du Bois wasn't always the revered figure in town that he is today, due to Du Bois' adoption of communism late in his life. "We have had a difficult time with the Du Bois legacy," Gunn said. "The feelings of town have changed since the '50s and '60s, where you couldn't speak his name without people getting riled up about it." While there are no concrete plans for what to do with the Clinton Church once it's fully restored, Gunn said he hopes it will serve as a home for Du Bois-themed educational programming. And it appears the little church, built 130 years ago, may be awoken from its current slumber.